Yuri Shibuya is an average baseball loving high school student. 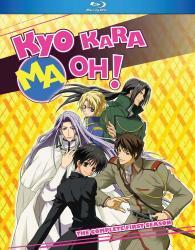 One day, Yuri tries to save his former classmate from a group of hoodlums. Turning on him, they drag Yuri into the bathroom and push his face into the toilet. When they flush the toilet, he is transported to another world! Yuri is then taken to a castle and crowned King of the Demon World! Is he going to end up as the leader of the land, surrounded by his extraordinarily handsome lieges or will he make it back home?